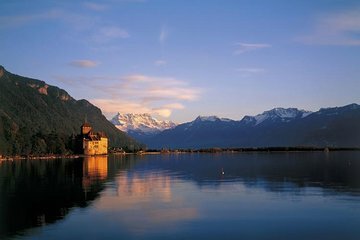 Discover hidden gems and top attractions around the French and Swiss Alps on this Montreux and Château de Chillon day trip from Chamonix. Delve into the Vaud region with a guide and enjoy free time to explore the village of Corsier-sur-Vevey. Travel by open trolley though UNESCO–listed Lavaux, and taste the region’s cheeses and wines. Explore the food and craft markets in Vevey, take an optional tour of the medieval Château de Chillon, and enjoy personal attention from your guide on this small-group tour, limited to 15 people. Take a seat in your air-conditioned coach at 7:30am in Chamonix town center, and relax on the 1-hour journey to Geneva. Along the way, enjoy sweeping views over Lake Geneva to the foothills of the Alps. When you reach Geneva, meet your guide and continue on into the countryside of the Vaud region. Take in sites of interest and spend time at your leisure in the pretty village of Corsier-sur-Vevey. Next, enjoy an open trolley tour of UNESCO World Heritage–listed Lavaux — famous for its fertile vineyards. Along the way, stop to sample some of the delicate cheeses and wines for which the region is known. Delve into the food and craft markets in bustling Vevey then, continue on by trolley to Montreux-Vevey — where tall palms and colorful flowers line the sidewalks. In the afternoon, visit the medieval Château de Chillon (own expense) — set on an island in Lake Geneva — and explore the chic lakeside town of Montreux. Stroll along the waterside pathways at your leisure and enjoy free time to browse the boutiques. Along the way, learn of famous names including BB King, Freddie Mercury, and Ray Charles who have lived and worked there over the years. We enjoyed the trip and all it had to offer but we were rushed through each stop. Not enough time to see all of Chillon Castle which was the highlight. We did have a nice relaxing picnic but I think it was so the boat cruise could be aligned with our arrival. There was a bit of confusion throughout the trip resulting in changing shuttles three times. This excursion would have been a very high rating if the trip could have been slowed down.